4thFeb 2019, Jalgaon, Engineering Export Promotion Council (EEPC) has conferred ‘Star Performer 2016–17 Award’ upon Jain Irrigation Systems Ltd. (JISL). State Finance and Planning Minister Sudhir Munguntiwar gave away this award to Mr Babarao Misal, Senior Manager (R&D) on 03rd February, 2019 at the grand ceremony in Mumbai at Hotel Taj Mahal Palace. 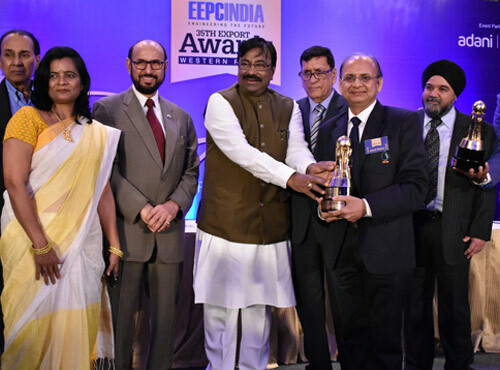 The distribution of this award for 2016–17 was held under EEPC Western award. The dignitaries from all over Maharashtra were present at the grand ceremony in Mumbai held at Hotel Taj Mahal Palace on Sunday 03rd February 2019. EEPC India President K L Dhingra made the introductory remarks while EEPC India’s Chairman Ravi Sehgal gave away the information.